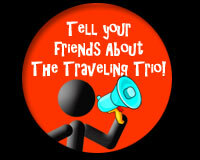 If you are a reseller who would like to offer The Traveling Trio on DVD through your store or catalog, please fill out the Wholesaler Application form below. There is a minimum order of twelve (12) DVDs per title ordered. Standard wholesale cost is $10.99 per DVD. Purchase orders should be emailed to orders@bigredhatproductions.com. A down payment of 50% is required on the first order. Once credit is established, 30-day net terms can be offered. All orders are shipped FOB Destination (free freight and insurance) to addresses in the USA. If you have any questions, please contact Big Red Hat Productions, LLC by email or telephone at 512-554-9618.